The Skinner European and Decorative Arts auction spanned two days. I watched some live and overall it was quite calm and orderly. Bidders in the room came and went but usually there were only a dozen or so active at one time. Some were clearly some “professionals” (antique shop owners? interior designers?) but there were also “private citizens” like me. There were 8-12 employees on the phone with buyers. Another two were handing all the active on-line bidding. With 1300+ lots, things moved at a pretty good pace but I followed along without a problem. “(Laughing) $2100 is even better. Do I have $2200? 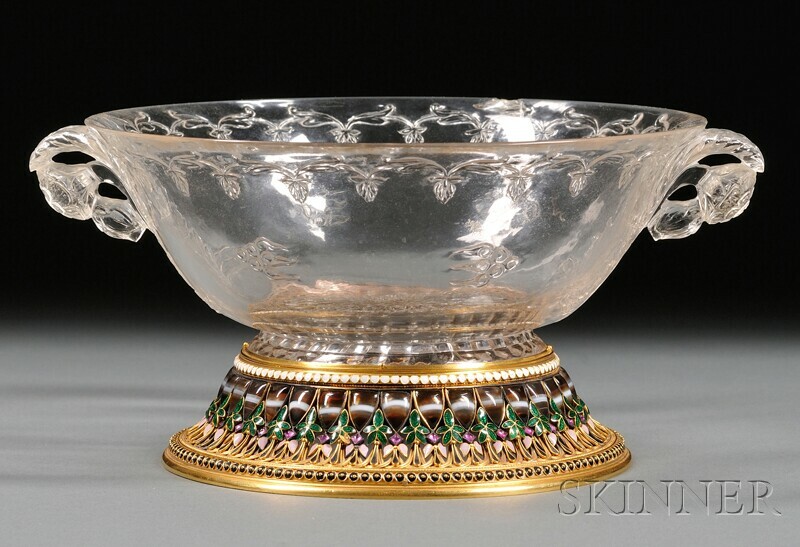 Sadly, I wasn’t present for the most exciting item of the auction: a carved crystal bowl with a gold, enamel and stone base. It was a delicate piece and had an auction estimate of $8-10, 000. It sold for $201,450 including the buyer’s premium! That’s incredible! 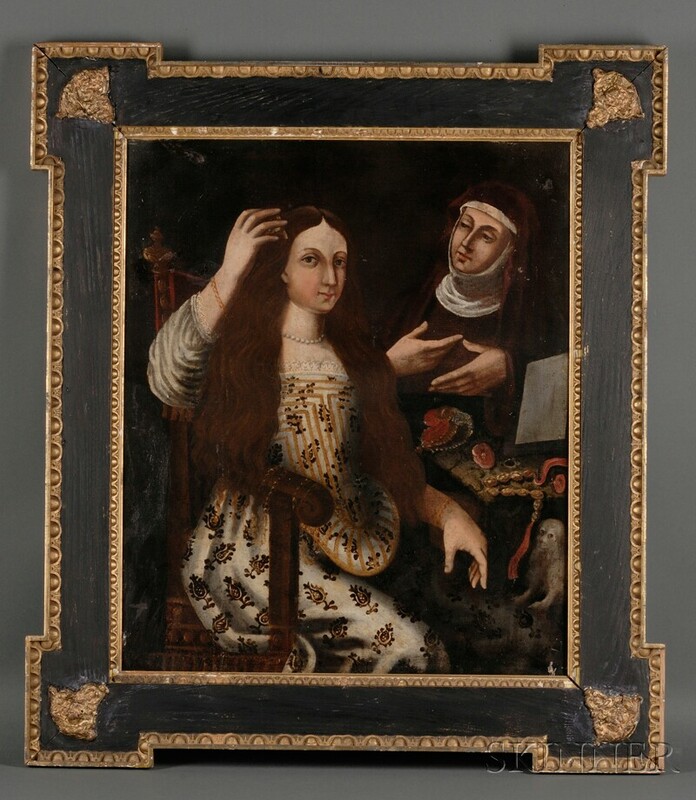 Other items going above their estimates included a 18th century French screen, a 19th century wooden Dionysius copy (which I presume is a rarity), and a painted porcelain plaque. There were also many items that sold below their estimates so patience would have really paid off if you were looking to buy. I was happy with one of the predictions I made during the preview session. I really liked the early Spanish colonial Portrait of a Lady and Her Maid. It was detailed and had a dark palate characteristic of its era. There was also a wonderful naivete to it as evidenced by the woman’s face, upheld arm and her awkward position in a very non-linear chair. This was a beautiful piece of folk art and I knew the $300-500 estimate was too low. 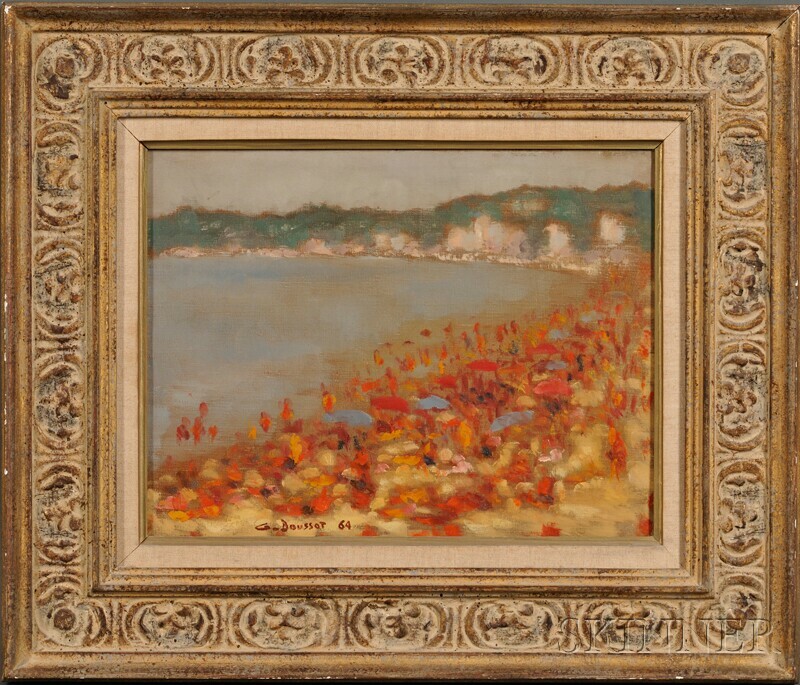 Of course, there always has to be the “one that got away” and in this case it was a lovely Impressionistic French beach scene from 1964. I loved the bold colors, the composition and that you could still see the bare tan canvas since it wasn’t completely painted in. Doussot’s style started out more somber and eventually became very cartoonist and child-like so this painting was a great treat. I had bid more aggressively for another item and so I missed out on this one. The good news is, I did buy a painting! (If you recall, I left conservative bids on four items.) I am really happy with it and the final auction price. I am currently enjoying it on my wall! Maybe I’ll write about it soon once I can do some more research on the piece and the artist. Overall I had a great time at the auction and would recommend it to anyone with interest in art, history or the antiques industry! ← Vincent Van Gogh: Murder or Suicide?